It's an Xpadder plugin for GameEx, silly! 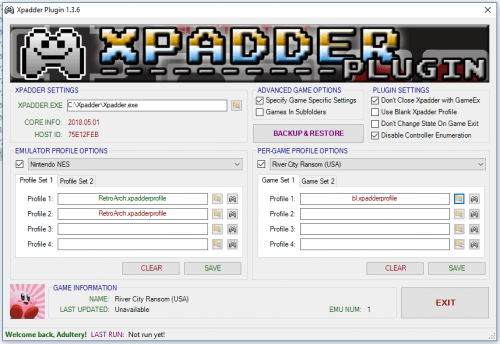 Seamlessly integrate Xpadder with GameEx with just a few simple clicks. Set the path to your Xpadder.exe, select your emulators from the drop down list, then set up your controller profiles. When GameEx runs the emulator you select, the magic happens in the background. No need to worry about .bat files or messy LaunchBefore/LaunchAfter commands. Say farewell to blank Xpadder profiles! This plugin handles the launching, the closing, and the profile switching quickly and easily without the hassle. If you use Xpadder, you'll love it! Create your Xpadder profiles, or use your existing ones. Unzip the PLUGINS folder to your GameEx directory. Launch the Plugin Manager from your GameEx start menu folder. Point the plugin at Xpadder.exe Select the emulator (or GameEx interface) from the drop-down list. Browse to your Xpadder profiles. Click "SAVE" Click the "EDIT" button next to the profile to load it and edit it from the configuration screen. Play your games! Check the box to leave Xpadder running when GameEx exits Check the box to enable using blank Xpadder profiles instead of killing the process Questions or comments? Head to the official release thread located here. For: Displaying Marquees or other single image stuff on displays additional to your main display. Install: Download. Unzip. Put the file in your GameEx/Plugins folder. Configure it and boom. Use: Searches for image in folders 1-4 (1 being prioritised) for both primary and secondary displays. Searches for image matching Gamename or Romname in jpg or png format. Area: constrain image to a specified specified area on the display. Area Offset: Use image at specified co-ordinates relative to 0,0 of the display. Use custom game lists within GameEx. Download, unzip and put files in the GameEx>Plugins Folder. Any questions or comments? Feel free to ask 'em. I also like feature requests and very much appreciate bug reports. Thanks again for using it! 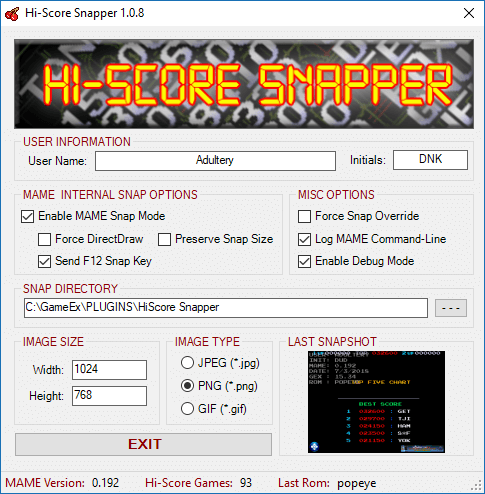 It's a plugin to take official snapshots of your MAME hi-scores for the GameEx Hi-Score Competition. This tool saves some leg work of having to type the same data everytime, and overlays some information and artwork to make it harder to fake. The overlay contains your username, initials used, MAME version, GameEx version, ROM name, and Override Mode (if used). Just take the snap and upload it to the game's competition thread. The configuration is really simple, just type in your user name and initials. Everything else is automatic. This plugin downloads and uses a centralized gameslist which is updated with the Hi-Score Database. As long as you have an active internet connection, you will always have the latest game list available. Offline users can download the gameslist.txt from here and place it in the GameEx>Plugins>HiScore Snapper directory. The plugin only enables itself for games that are in the database, so there's no effect on your MAME games at all. Just take a snap of your high score by holding [sHIFT+HOME] (I have a hotkey set up for this in Xpadder and it's working great! You can take many pictures in a row in the case of blinking hi-scores). I also added a camera shutter sound effect that plays when the snap is taken, so you know you got it. The snap is then overlaid with the artwork and information in the picture, and you can come upload it to the thread when you're done. This is the username you use for all your leaderboard entries. The global leaderboard depends on this! The images are saved in the root folder specified, with a subfolder for the game name. The physical file name is generated based on a time stamp of when it was taken. To view the last game snap you took using the plugin, click on the preview image in the lower right corner to open a viewer window. There is also a status strip at the bottom of the configuration form that will show what version of MAME you currently have set up in GameEx. I can't seem to get pictures from D3D without a great deal of extra work (the snaps all come out black). So unfortunately I have decided that the only way I can support D3D snapshots is by having the user compile their own version with DirectInput enabled. The process really isn't that difficult, and helps with adding support for things like Xpadder compatibility to your build. UPDATE: As of 1.0.3, you no longer need to worry about renderer changes. MAME Mode supports all renderers that MAME supports instead of forcing DirectDraw. I found a bug! What do I do about it? If you have questions, suggestions, or bug reports, please direct them here. Thank you for your support! It's a Plugin Development tool that does some logging of plugin data. If you need to know what event is triggered when, this tool is your friend! You can log everything, only events, only menu changes, and only inputs with a check in the appropriate box. Select the option to log GameData if you're tracking the GameExInfo variables, and select the UI Timer option to log GameEx timer ticks. I've been using this plugin for a while so I can learn my way around GameEx's PlugIn system, and I added an interface for the end user so you don't have to struggle to learn the ins and outs like I did my first time. Visit the official RELEASE THREAD for questions or comments. It's a plugin for an alternate gamer tag for GameEx. Not to take anything away from the one that's already available, but one can never have too many choices, right? Along with the tag and the hosting, you can skin this to suit your needs. The tag supports custom fonts (you can set your own outline and fill color too! ), a custom 'no game image' image, and a user avatar, as well as the background image. 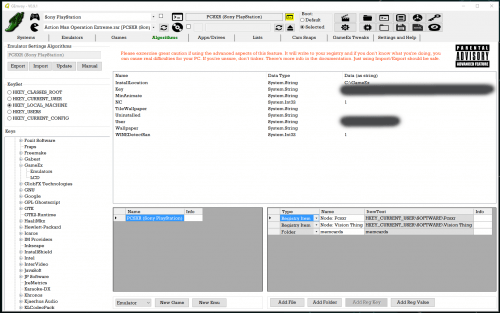 You can copy and paste the HTML or BB Code right from the configuration page into your forum signature virtually anywhere you frequent. Simple, right? There's a ton more information available in the release thread, which is also the best place to go for bug reports and suggestions. Download the plugin. Register your account on DracLabs from the registration page (you can click here or just press the REGISTER button). Authenticate your account via the link in the email the page sends out. Select or create your theme from the pull-down menu. Watch your friends be amazed! The new Game Info beta has an integration already set up to display the tag on your second monitor, if you choose to use it. The web page has a user control panel to do some stuff, like see your current tag, change your password, view your stats, etc. The web page will have a section where you can view other user's tags and see what they're playing too. Up to 9 layers to customize your tags however you like, including 3 low level layers, 3 middle level layers, and three top level layers Add wildcards to your layers to add dynamic images to your tags. Visit the official RELEASE THREAD for further details and a complete changelog, or for bug reporting and feature requesting. You can also download new themes for Game Info here (if you don't want to use the downloader that is baked into the config) and get the Last.FM patch from here to enable the Last.FM integration for your jukebox. This plugin does various stuff. 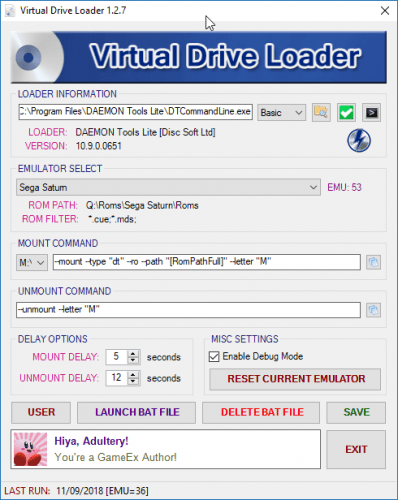 It's main aim is to make running multiple emulators for each system as easy as possible. You can setup all your emulators in GEmvoy first - running and testing them from there before dovetailing with GameEx. You can also choose which Emulator to launch a game with from GameEx itself. Lots of additional stuff. Best way to find out what it does - download it and have a tinker - it's very low impact on GameEx; your game and asset files + your existing setup, so you can't break anything. Quickly launch zipped gamefile sets without having to wait for them to unzip. Have different system emulators mapped against one GameEx 'emulator.' Be able to choose which emulator boots a game from the Game Details page in GameEx. Simple approach to mounting gamefiles Test emulator/games setups before running through GameEx - boot games in "Fullboot" or "Setup boot" modes. 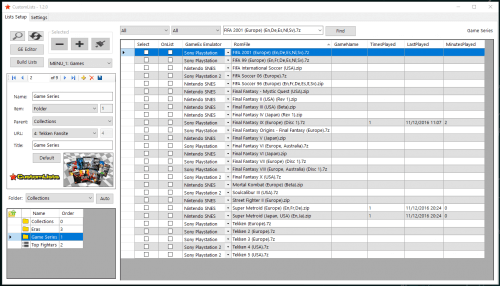 Can work with multi-format gamefile sets for one emulator (e.g. Playstation sets with mixtures of .cue, .mds etc.) Save emulator settings on per-game basis, allowing for different graphics, sound and controller setups for each game. Launch support apps before, alongside or after a game boot on a per-system, emulator or game basis. Full tokenised game/system/emu details allowing insertion of these into any command lines. Make your own emulator settings scripts, swapping out files, folders and registry entries between game boots. Key-remaps on per emulator or game basis (experimental) Timelapse picture capture via webcam during games. Continuous, timed or burst mode. GameEx tweaks allowing: Choose which sounds to use for the GameEx menu Choose to use random sounds for the above Relocate the message window from the bottom right User prompting throughout any unzips showing progress. GameEx 14.36 and beyond features support for backend TV servers via the use of XML files and plugins to generate these files. This is a plugin for Engima 2 set top boxes. These are set top boxes running a version of Linux called Enigma 2. Mostly just in Europe. Source code for the TV plugins is available under the general Plugins category. GameEx 14.36 and beyond features support for TV server backends via the use of XML files and plugins to generate these files. This plugin supports ServerWMC, a backend server for Windows Media Center. Note that HTTP must be enabled in ServerWMC and currently GameEx tells the plugin to treat it as a Plex client. Source code for the TV Plugins is available in the general plugins download category. More of a demo of the power of the GameEx plugin system. Play music while continuing to navigate within GameEx, much like the arcade game. Please see the LEDBlinky web site for the latest features, updates, support, and to purchase the software (remove Trial Version limitations). You can use multiple combinations of any of these LED Controllers. [*]Supports MaLa, AtomicFE, GameEx and PinballX integration via plug-in OR stand-alone operation for HyperSpin, Maximus Arcade, or any arcade Front-End (FE) software. [*]Light active and/or inactive controls for MaLa, AtomicFE, GameEx, PinballX, HyperSpin, or Maximus Arcade user interface. [*]Light active and/or inactive controls for MAME emulation. [*]Light active and/or inactive controls for other emulators. [*]Easily configure control attributes (color, intensity, spoken action, input codes, etc.) on a game by game basis, or define defaults for each emulator. [*]Remapping controls (MaLa, AtomicFE, GameEx, PinballX, HyperSpin, Maximus Arcade or MAME) will automatically remap the associated LEDs. [*]With RGB LEDs, you can specify colors for individual controls or using a pre-defined colors.ini file, match the original game control panel button colors. Colors or intensities can also be customized on a game-by-game basis. [*]Use audio output (music or game sounds) to blink, fade, or animate LEDs - great for use with Jukebox software. [*]Blink and speak front-end UI controls by pressing a pre-defined "Help" button. [*]Blink and speak controls when pausing a game and/or play a LED animation (selected, random, random montage, or specific to each game) or use audio output (music) to animate the LEDs. This is a MAME only feature. [*]Flash start buttons when credits are available - this is a MAME only game dependent feature. [*]Light start and coin buttons based on active player count for the current game. [*]Full support for other MAME Outputs - light LEDs based on any output. Outputs can be linked to controls (P1_Button1, P2_Button2, etc.) or directly linked to a LED Controller/Port. [*]Extensive audio animation options let you completely customize how the LEDs blink to music or game sounds. [*]When starting a game, LEDBlinky can play a LED animation (selected, random, or specific to each game), speak the game name, speak each button "action" while blinking the button in its correct color, speak the primary controls, and speak a custom message. When speaking the game name or custom message, LEDs can blink in sync with the speech. [*]While playing a game, LEDBlinky can play a continuous LED animation (selected, random, random montage, or specific to each game) or use audio output (game sounds) to animate the LEDs. The LED animation will only effect unused controls. [*]When starting or quiting the front-end, LEDBlinky can play a LED animation (selected or random), and speak a custom message. When speaking the custom message, LEDs can blink in sync with the speech. An LED animation can also play whenever the front-end UI is active (including audio animations). [*]When changing game lists or emulator lists, LEDBlinky can play a LED animation (selected or random). [*]When the Front-End and/or Screen Saver is active, LEDBlinky can play a continuous LED animation (selected, random, or random montage) or use audio output (music) to animate the LEDs. Random custom messages can be played at predefined intervals. Berzerk mode is also available for the random messages. [*]When the Front-End is active, flash all or active buttons when any is pressed. [*]Other speech features are available - Choose from multiple voices (downloadable) and set the voice rate and volume. [*]Run (independent) LED animations for cabinet lights. These animations can run for all standard LEDBlinky events; FE Start, FE Quit, FE Active, FE Screensaver, Game Start, Game Pause, and Game Quit. Animations can also be specified for individual games. This feature requires an additional LED Controller for the non-control panel LEDs. [*]From the front-end user interface, game controls can be lit as you scroll through the game lists. This feature is currently only supported by MaLa, AtomicFE, GameEx, PinballX, HyperSpin and Maximus Arcade. [*]Designate LEDs as "Always Active" for use with coin, start, or administration controls. [*]Cocktail Mode lights all player controls for multi-player alternating games. [*]Use the LED-Wiz built-in blinking effects. [*]Set the GP-Wiz49 (for 49-Way joysticks) or Ultimarc UltraStik 360 joystick digital restriction based on the currently selected game's primary control. [*]Switch the Ultimarc ServoStik's restrictor plate between 4-way and 8-way based on the currently selected game's primary control. [*]Support for pre-defined controller files (X-Arcade, SlikStik, etc). [*]No Microsoft COM control dependencies. [*]Use the LEDBlinky Animation Editor to create your own animations. Quickly create and edit LED animations for supported LED Controllers (see above). Generates optimized LWAX files supported by LEDBlinky. Other LED applications (such as the MaLa LEDWiz plugin and GameEx LEDWiz plugin) also support the LWAX format. Loads both LWAX and LWA animation formats. Virtual control panel designer. Supports both single type and RGB type LEDs. WYSIWYG interface. Both the virtual control panel and actual control panel will show the LED intensity/color. Real-time animation testing. Advanced Fade and Color Transition Effects. Your computer will speak the game names and descriptions. 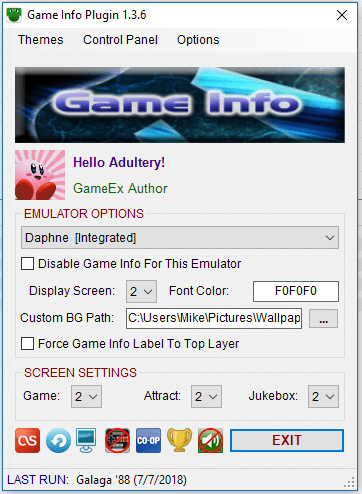 Hide the mouse cursor in GameEx and emulators. Exit GameEx using a keyboard or gamepad combo/password. MC Lite is a very basic, stripped down version of MAME Commander for users that just want to add new command-line arguments to MAME on a per-game basis. If you know the ROM name, and you know what arguments you want to use, this tool is your friend. Since the plugin will append GameEx's arguments, you can override a global switch by adding the counter switch. For example, if you were using -ka to maintain the aspect ratio, adding -noka to the plugin will force MAME to stretch the game. Visit the GameEx Project Thread for more information about this plugin, to report bugs, make feature requests, or to view the full changelog. If submitting a bug report, please attach a copy of your log file!